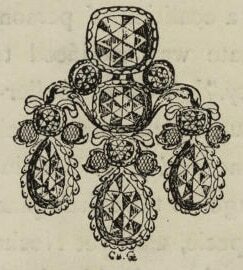 A girandole is an earring design in which three dangling pear-shaped ornaments are suspended from a central bow motif. This design enjoyed popularity for a hundred years, spanning part of the seventeenth century into the eighteenth. These designs were produced throughout Europe using all manner of gemstones. When the fashion waned, the earrings were often disassembled and the parts re-purposed as pendants and re-designed earrings.